Spa or fun pool with jacuzzi...there’s something for everyone. Take advantage of the well-being facilities of our thermal spas to relax after a day’s skiing. Spa treatments are a tradition which goes back to the Romans. At the beginning of the century, thirty seven thermal springs were recorded. Nowadays, the majority have been completely forgotten ; but the water continues to flow, imperturbable, as in the earliest times ! It’s the Roman stamp of approval that everyone claims ; for the properties of these waters that were made so much use of by the Gallo-Romans made these people into the first builders of highly sophisticated thermal systems. The Pyreneans are moreover very proud of having treated the Emperor Tiberius’ rheumatism ! But in the Middle Ages, people had little opportunity to worry about their well-being and it wasn’t until the Renaissance, and later on the 19th C., that this type of medical treatment really enjoyed its glory days. The Comminges, through its history, climate and geography is now heir to this "spa tourism" and our tour, even if sometimes it includes an abandoned spring or a "Hôtel des Thermes" whose shutters are firmly closed, will also guide you towards the insights and splendour bequeathed by these magic waters ! 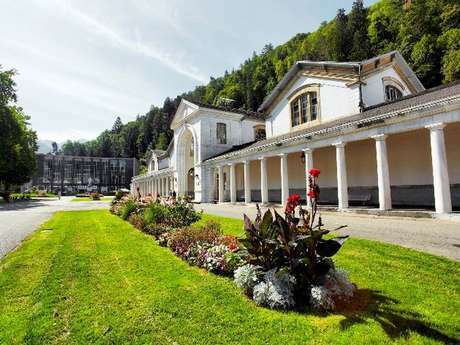 Two major thermal spa and well-being centres in the Haute-Garonne : Salies-du-Salat and Luchon. Two springs determined the destiny of Salies-du-Salat as a spa. One, with sulphurous waters, was little used, the other salty one gave its name to the place beside the Salat, called "Salinea" by the Romans. When it was realised that the spring had cured two patients in 1880, it was decided that a building should be constructed with two baths, a fireplace and a bathing cabin. The regular use of the waters, whose mineral content is the highest in Europe, began in 1853. Nowadays, the spa centre successfully treats developmental problems in children, rheumatology and gynaecological problems. The charm of Salies has much to do with its wide promenades with majestic trees whose shade is much appreciated in summer, and with its little streets lined with half-timbered houses. The thermal centre is a magnificent construction dating from the early part of the 20th C. (1925) ; the façade is striking and the architecture neo-egyptian with its ceramic decorations and massive columns. And then, Luchon got itself organised, built facilities, and became "the Queen of the Pyrenees", a title to which it has jealously clung until this day ! The peoples of the Luchon area recognised very early on the properties of the spa waters. It was during the reign of Augustus that the city of Ilixon was founded ; indeed, the Gallo-Romans raised numerous altars to their gods who restored them to health. It was the 18th C. which saw the revival of the thermal spa. A road was built from Montréjeau to Luchon, a first establishment burnt down and in 1848 Chambert constructed a new thermal centre. Luchon became fashionable, and the "Great and the Good" came to bathe here (Hugo, Lamartine, Flaubert...). But let’s talk about the waters themselves and their properties ! Two bore holes 130 and 160 metres deep pour out more than 1000 m3 of water at 65° to 73° C every day. These sulphurous, sodic waters treat ear, nose and throat conditions and diseases of the joints (arthritis, rheumatism). And why not take advantage of the well-being sessions (Forme et Bien-Etre) with the Vaporarium (natural hammam in the rock itself), unique in Europe.